2.13.1 Follow Us on Facebook! This post will cover the Top 25 universities for GRE scores of 310 to 320. Previously, we covered lists of Universities for GRE Scores 290-300 and Universities for GRE Scores 300-310. So, to get admitted to these universities, not only does your GRE score matter, but so does your overall profile. 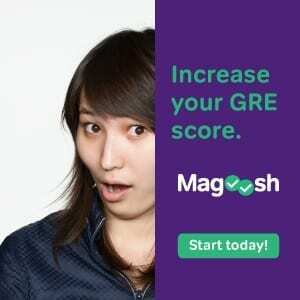 Your GRE score is a part of application. One cannot apply to different universities only based on GRE score. For example, a candidate having a GRE score of 305 can get admission from a university in the 310-320 range! But sometimes candidates who have a GRE score of 312 can’t get admitted to a university in the range of 305-310! So it is hard to tell which University you can get admission to. Considering this, you should apply to universities which are super safe for your profile. If you are preparing for GRE, and you need practice tests of GRE then See our list of online GRE practice test. These are among the top U.S. Universities. To get admitted to one of these universities, your profile should be outstanding. Your GPA should be GREater than 3.0 with no backlogs (or maximum 1 or 2 backlogs). Your SOP will play a very important role in this, so make your SOP outstanding. If your overall profile is really good, then there is a chance of scholarship or assistantship from this universities. Arizona State University, commonly referred as ASU, is a research university with very high activity. 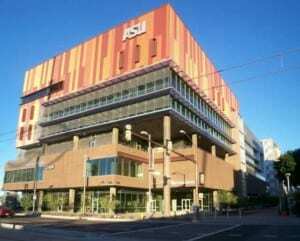 As they boast, “Since 2005 ASU, has been ranked among the top research universities, public and private. The 2015 U.S. News & World Report ranking of U.S. colleges and universities ranked ASU’s undergraduate program 63rd among public universities and 129th of 280 ‘national universities.’” ASU lies in middle of Phoenix (the capital of Arizona). There are many job opportunities there. Indiana University Bloomington, commonly referred to as IU Bloomington or IUB, ranks in the top 100 national universities in the United States and the top 50 public universities in the country. In 2010, the Academic Ranking of World Universities gave IUB a world rank of 90 and a national rank of 50. Time Magazine named IUB its “2001 College of the Year” among major research universities. The University is considered a “Public Ivy.” Indiana University is a hot favorite for Computer Science Engineering aspirants. Part time Jobs – Available but competitive. Scholarship Opportunities- Easy and Generous. The State University of New York at Buffalo is a public research university with multiple campuses located in Buffalo and Amherst in United States. It is commonly referred to as the SUNY Buffalo. The University at Buffalo is the state’s largest and most comprehensive public university and is spread across three campuses: North Campus, South Campus, and Downtown Campus. SUNY Buffalo is an ideal place for international students because it has a decent location and low tuition fees. University of Florida is commonly referred as UFL. The University of Florida is located on a 2,000-acre campus in North Central Florida. In 2015, U.S. News & World Report ranked the University of Florida as tied for the 14th-best public university in the United States and tied for the 48th overall among all national universities, public and private. Many of the University of Florida’s graduate schools have received top-50 rankings from U.S. News & World Report. UFL is also famous for partying 😉 it has GREat student communities, and free entries to midnight parties 😉 Suitable for GRE score 310-315. The University of Texas at Dallas, commonly known as UTD, is a public research university. The main campus is in Richardson, Texas is 18 miles north of downtown Dallas. The U.S. News & World Report’s 2013 edition of Best Colleges ranked the University of Texas at Dallas as a “Tier 1” national university at 142 overall and 73rd within public universities. The U.S. News and World Report 2015 rankings of graduate school programs ranked the UT Dallas’ Erik Jonsson School of Engineering and Computer Science 71st among graduate engineering programs. UTD is one of the finest colleges at which to pursue engineering courses and is suitable for students with GRE scores of 315-320. George Mason University is commonly known as GMU and is located in Fairfax, Virginia, United States. 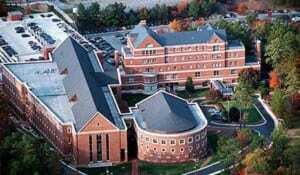 GMU is the largest public research university in the Commonwealth of Virginia. George Mason University or GMU is suitable for Electrical Engineering and Computer Science students and is a good place for students with average profiles. Suitable for GRE score 310-315. University of Illinois-Chicago is also known as UIC, is the largest university in the Chicago area. UIC operates the largest medical school in the United States. In the 2015 U.S. News & World Report’s ranking of colleges and universities, the University of Illinois at Chicago ranked 149th best national university and 78th best national public university. UIC is Better for Mechanical Engineering and is suitable for GRE Scores of 310-315. The University of Iowa is also considered a public Ivy. In 2015, U.S. News & World Report ranked University of Iowa graduate programs 22nd among the top 25 in the nation. Washington State University is also known as WSU. The university is well known for its programs in chemical engineering, veterinary medicine, architecture, neuroscience and communications. WSU boasts very high research activity. WSU launched an Internet-based Global Campus, which includes its online deGREe program: WSU Online. WSU is ranked 138th nationally and 70th among public universities in the 2015 U.S. News and World Report rankings. It is known for its very high Acceptance rate. Suitable for GRE score 310-315. MSU is one of the largest Universities in the state. Mississippi State University. MSU has very low tuition fees and is classified as a “comprehensive doctoral research university with very high research activity” by the Carnegie Foundation. Don’t get this school confused with University of Washington or Washington University. 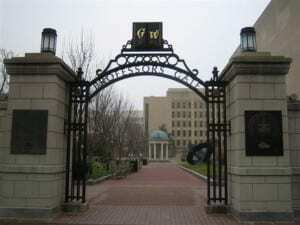 George Washington University is the largest institution of higher education in the District of Columbia. GWU is consistently ranked by The Princeton Review in the top “Most Politically Active” Schools. A recent report from The Times Higher Education included the George Washington University in a list of the world’s top 100 universities for ‘producing millionaires’. GWU was ranked 52. Cost of living is high in this area. The University of California, Riverside (UCR or UC Riverside), is a public research university and one of the 10 general campuses of the University of California system. The main campus sits on 1,900 acres (769 ha) in a suburban district of Riverside, California. In the 2015 issue of U.S. News & World Report’s “America’s Best Colleges”, UCR tied for 113th among national universities. Riverside is only one hour way from Los Angeles. 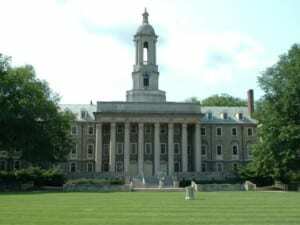 Pennsylvania State University is also known as Penn state or PSU. Penn State is one of the largest universities in United States. 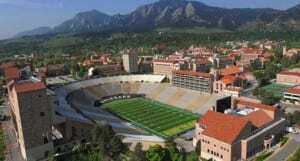 It has the world’s largest dues-paying alumni association. The 2013 Academic Ranking of World Universities ranks the university 54th among universities worldwide and 37th nationally. PSU has GREat faculties and also it is research-oriented university. Penn State is very famous among Asian and Indian Students. Suitable for GRE score of 315-320. As of 2015, U.S. News & World Report’s widely-read rankings of undergraduate colleges in America places Ohio State as tied for 54th overall ranked university in America. 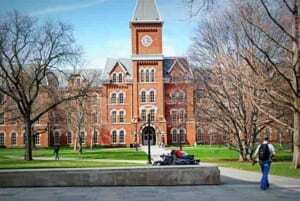 Internationally, in 2011 QS World University Rankings ranked The Ohio State University 111th in the world, and awarded the university with the maximum five stars for excellence. OSU has very solid program for Computer Science and Network Engineering. State University of New York at Stony Brook is also referred to as Stony Brook University, SUNY Stony Brook, Stony Brook, or SBU. It is part of the State University of New York (SUNY) system. In 2015, U.S. News & World Report ranked Stony Brook University as 88th overall among national universities. Stony Brook has wide variety of student-run organizations on campus. STONY Brook is famous among Asian and Indian Students because of courses offered by them and for its low fees. Suitable for GRE score 315-320. New York University is right in the middle of the city, and it is the finest place to study. NYU is a very large university in terms of area. Most of NYU’s buildings are located across a roughly 229-acre campus. NYU had the seventh-largest university housing system in the U.S. as of 2007. NYU offers unbeatable opportunities for internships and Jobs. 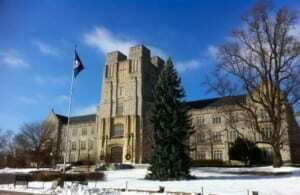 Virginia Polytechnic Institute and State University is popularly known as Virginia Tech and hosts its main campus in Blacksburg, Virginia. In the U.S. News & World Report‍’s 2015 Best Colleges, Virginia Tech ranked 71st among national universities and 27th among public. U.S. News & World Report’s America’s Best Graduate Schools 2015 ranked the College of Engineering 21st among the nation’s best engineering schools for graduate studies. The University of California, Davis is also referred as UCD or UC Davis. The school reports that it “encompasses 5,300 acres of land, making it the second largest UC campus in terms of land ownership. UC Davis also has the third-largest enrollment in the UC System after UCLA and UC Berkeley. The 2015 U.S. News & World Report college rankings named UC Davis as the 9th best public university, 38th nationally, and 4th of the UC schools, following UC Berkeley, UCLA, and UC San Diego.” UC Davis is also considered to be a “Public Ivy”. It has more than 500 student organizations. 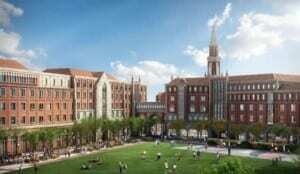 The University of Southern California, also known as USC, is California’s oldest private research university. n 2011, USC was named among the Top 10 Dream Colleges in the nation. USC is ranked 46th among world universities and 32nd among universities in the Americas by the Academic Ranking of World Universities. 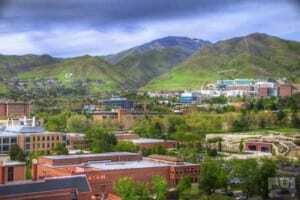 The University of Utah is also referred as UTAH or the U. UTAH is in the scenic location of Salt Lake City. 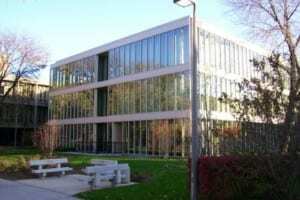 It has broad range of research centers and laboratories. You can find part time jobs easily in Salt Lake City. Jobs are also excellent after graduation. ISU is ranked among the top 50 public universities in the U.S. and is known for its degree programs in agriculture, engineering, and science. Overall, ISU ranks #101 in the U.S. News & World Report ranking of national universities and #45 in the Washington Monthly rankings. 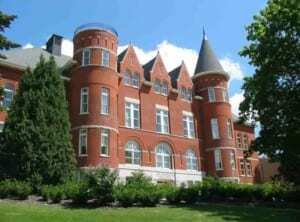 ISU is known for its high acceptance rate and very affordable fees. Fun Fact- Iowa State played a critical role in the development of the atomic bomb during World War II as part of the Manhattan Project. 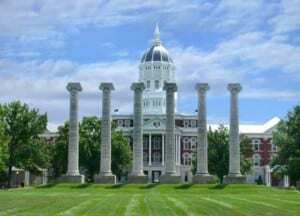 The University of Missouri is the largest university in the Missouri. The University of Missouri was ranked #99 in the 2015 U.S. News & World Report among the national universities. The campus of the University of Missouri is 1,262 acres. The university maintains the largest library collection in the State of Missouri and is home to more than 40,000 plants and trees in the campus. The University of North Carolina at Chapel Hill is also known as UNC, UNC-Chapel Hill. North Carolina is one of the original eight Public Ivy schools. The campus covers a rather small 729 acres over Chapel Hill’s downtown area. In 2013, the U.S. News & World Report ranked UNC Chapel Hill 5th among the nation’s top public colleges and universities. The University of California, Santa Barbara is referred as UC Santa Barbara. The main campus is located on a 1,022-acre. 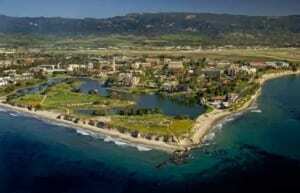 UCSB is one of America’s Public Ivy universities. UCSB was ranked 40th among “National Universities”, 10th among U.S. public universities and 28th among Best Global Universities by U.S. News & World Report’s 2015 rankings. So, this is it !! There are plenty of more universities which can be added in this list but I have added some of the best universities in this list. 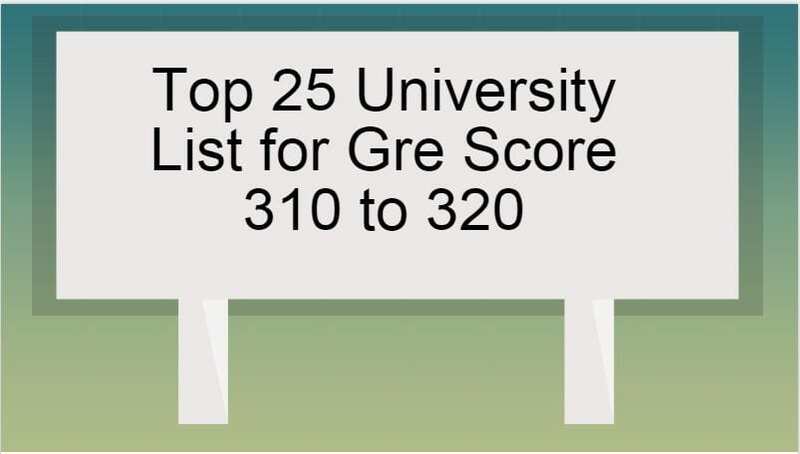 These were Top 25 Universities for Gre score 310 to 320,If your GRE score is between 290 to 300 then read the list of Universities for Gre score 290 to 300,and if your GRE score is between 300-310 then read the Universities for GRE score 300 to 310. This article was totally inspired by crunchprep’s University list for Gre score 310 to 320, and Wikipedia. Can you please suggest some good colleges please. I am very confused. My Gre score is :310…and awa is 3. My grades are 8.99/10…what are the colleges I can get admission into? Thanks for sharing the Top Universities List. The above mentioned fees are for the entire course or annually? Hi u have mentioned the fees.. Is for a year or both the years? ?